University of Chicago Press, 9780226073057, 336pp. Miles of shelf space in contemporary Japanese bookstores and libraries are devoted to travel guides, walking maps, and topical atlases. Young Japanese children are taught how to properly map their classrooms and schoolgrounds. Elderly retirees pore over old castle plans and village cadasters. Pioneering surveyors are featured in popular television shows, and avid collectors covet exquisite scrolls depicting sea and land routes. Today, Japanese people are zealous producers and consumers of cartography, and maps are an integral part of daily life. But this was not always the case: a thousand years ago, maps were solely a privilege of the ruling elite in Japan. Only in the past four hundred years has Japanese cartography truly taken off, and between the dawn of Japan’s cartographic explosion and today, the nation’s society and landscape have undergone major transformations. At every point, maps have documented those monumental changes. Cartographic Japan offers a rich introduction to the resulting treasure trove, with close analysis of one hundred maps from the late 1500s to the present day, each one treated as a distinctive window onto Japan’s tumultuous history. Forty-seven distinguished contributors—hailing from Japan, North America, Europe, and Australia—uncover the meanings behind a key selection of these maps, situating them in historical context and explaining how they were made, read, and used at the time. With more than one hundred gorgeous full-color illustrations, Cartographic Japan offers an enlightening tour of Japan’s magnificent cartographic archive. Kären Wigen is the Frances and Charles Field Professor of history at Stanford University. Sugimoto Fumiko is professor of history at the University of Tokyo’s Historiographical Institute. Cary Karacas is associate professor of geography at the College of Staten Island, CUNY. 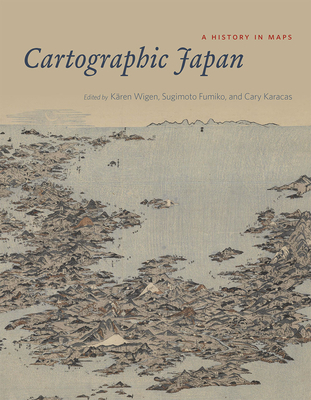 "Cartographic Japan constitutes a significant addition to the academic literature on the history of Japanese mapping. Much like the works it describes, the volume may also be treasured as a piece of art and collector’s item in its own right. In appearance it is similar to an atlas: oversized, with slick heavy pages laden with full-color reproductions of historical maps....Inspired by the equally beautiful and sweeping Mapping Latin America: A Cartographic Reader (University of Chicago Press, 2011), Cartographic Japan is a deeply rewarding compilation of maps and the scholars who appreciate them. The result will be enjoyed not just by researchers in the field of Japanese studies but by all map lovers and bibliophiles." "Written for a general audience, this remarkable volume is intended to introduce readers to the 'treasure trove of colorful materials' that make up 'one of the world’s most diverse and spectacular cartographic archives.' Each of the 58 short chapters focuses on a particular image—a tourist map of Edo, a Buddhist conception of global geography, a coastal survey, an outline of the destruction of Hiroshima, a digital rendering of radiation from the 3/11 nuclear disaster—accompanied by a few pages of descriptive text highlighting the map’s historical (or possibly social, political, cultural, or religious) context. Scholars of Japan will recognize a veritable who’s who of contributors, among them Ronald Toby, Marcia Yonemoto, Constantine Vaporis, Kären Wigen, Mary Elizabeth Berry, Henry D. Smith II, Tessa Morris-Suzuki, and Theodore Bestor. Given rising scholarly interest in material and popular culture, as well as Japan’s centuries-old mapmaking tradition, this is an endeavor both timely and timeless. Moreover, it is a beautiful book, with color photographs throughout. An enchanting and even poignant volume that should find a ready home in any college or university library. Essential." "This capacious and thoughtful volume is simultaneously three books. It is an illustrated collection of essays on Japanese cartography for a broad audience; it is a skilfully curated cartographic trove dating from the late sixteenth century to the present day; last but not least, it offers a unique template for teaching the history of Japan through maps, both in the context of East Asia and within larger world history." "Cartographic Japan is a visually stunning and historically detailed compilation that illustrates this inherent power in maps and mapping while telling the story of one country’s history and place in the world." "Cartographic Japan: A History in Maps, from the University of Chicago Press, is expressly intended to open a window for the non-Japanese reader on a sweeping landscape of Japanese cartographic artifacts, history, and scholarship." "If you’ve ever wondered why Japanese cities have no street names, or why many modern tourist maps are cartoonish with no scale or positional accuracy, the book’s discussions of the roots of such phenomena should be of interest. . . .Cartographic Japan is thus an exploration to be welcomed—primarily for its informative and enriching text and additionally for the artistry contained in the maps it presents and the individual histories of these snapshots in time." "The book is neither a history of maps nor a history of Japan, but rather an exercise in what it means to think about Japanese history with maps, a rewarding experience that made this reader realize that teaching or writing about Japan without regular reference to historic maps is no longer an option."